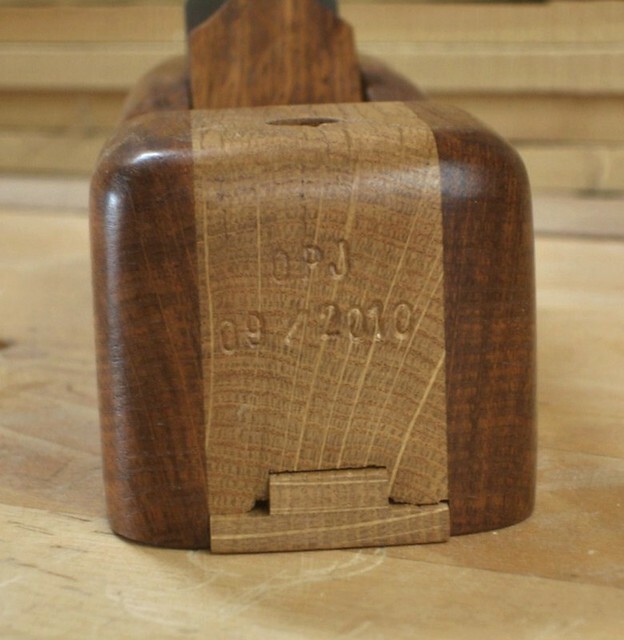 As we cross the deadline for British Woodworking’s Planemaker of the Year 2010 challenge [apologies if I hadn’t mentioned it before! ], I’m now happy to walk you through the design of my entry. I also understand that all entries will be on display at the European Woodworking Show, early next month. 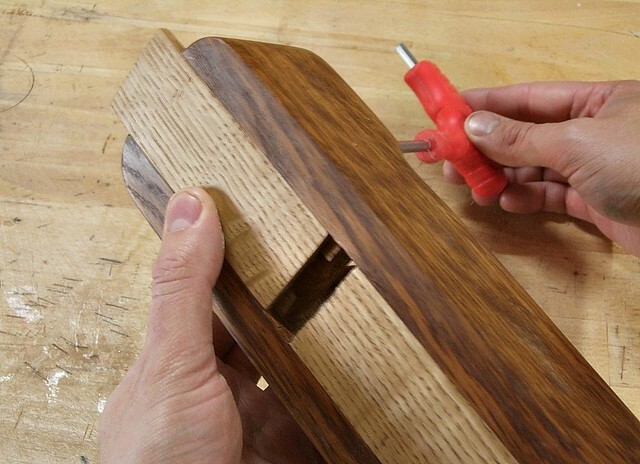 For those of you who may not follow Britain’s No.1 woodworking magazine often enough; the brief requires all entrants to make a wooden plane for primarily planing long-grain within the dimensions of 250mm long x 75mm wide and no greater. 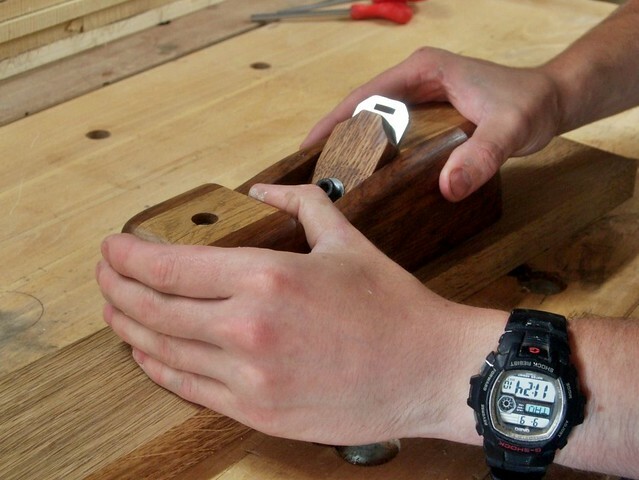 This competition has spawned off the success of the Block Plane Challenge – this initiative was started by the magazine in 2009 and, as it has already proven to be a success amongst one school in Oxford, it is growing at a steady rate, with several other schools now encouraged to take up the challenge next time. 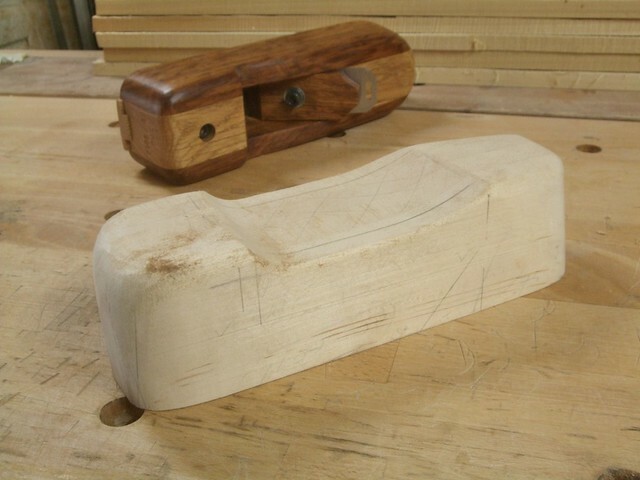 Students are encouraged to design and produce their own block planes, which they then go on to use in other projects. During the first iteration of this initiative, it was discovered that teenagers found standard 50mm blades (as found in most no.4 smoothing and no.5 jack metal planes) were uncomfortable to use, which is why they’ve since switched over to using shorter block plane blades, with a width of 35mm (as I have also done). It may be that, through future use of this plane, I realise I should’ve tried harder to accommodate a wider blade… Essentially, I made this one as a trial or mock-up for future designs and, to be brutally honest; with its narrow cutting width, I’m not sure exactly where it would fit in amongst my arsenal of metal-bodied planes! There are a couple of features I’ve included which I think you may like – so, please, read on! Another important feature I wanted to try and include was a means to simply and quickly adjust the width of the aperture in the sole of the plane. 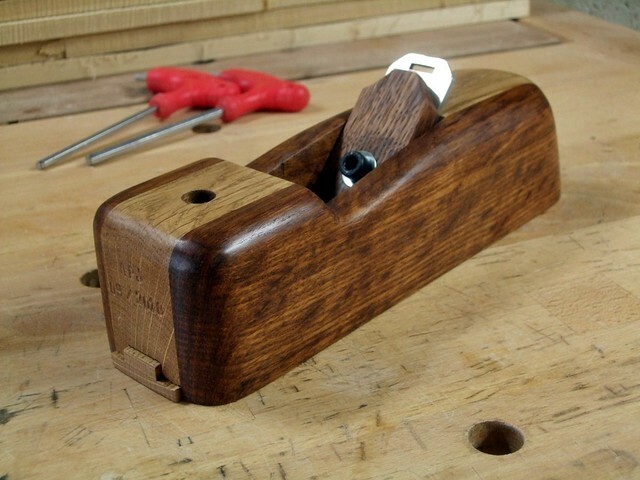 My inspiration came from your average low-angle block plane, where the the front-piece of the sole is able to slide back and forth by loosening the thumb-screw at the toe-end of the plane. 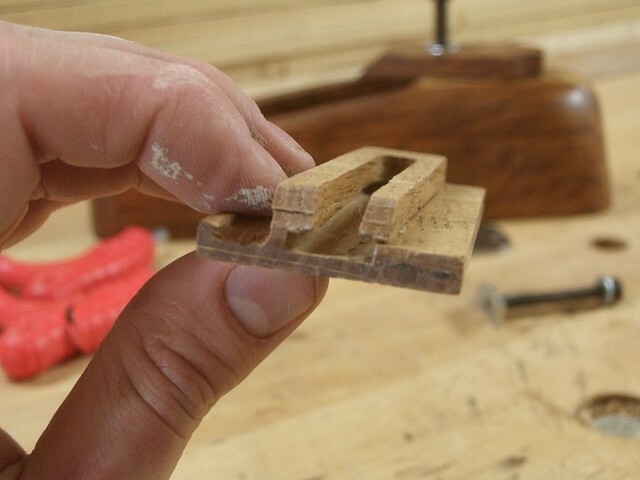 On most larger bench planes, you have to partially strip the plane apart and loosen two screws securing the frog to the sole, before then moving the frog assembly as required (yes, it is as awkward and time-consuming as it sounds!). In order to achieve this, I built up a T-section of oak for the sole which slides in a corresponding T-slot, routed in to the front of the plane’s body. 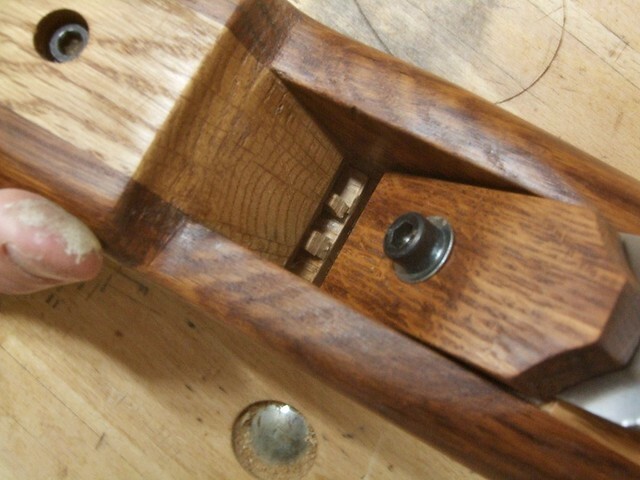 Inside of this is a concealed sliding nut (M6 thread – available from Workshop Essentials.com), which is secured using a 50mm long set screw [5mm allen key] from above (hence, the hole you can see in the first photo, near the toe). I’ve also fitted a block plane blade that’s thicker than the standard issue irons. This one’s from the Quangsheng factory in China, available from Workshop Heaven for about £10. Very reasonable, I thought. While it would’ve been nice to have used a British-made iron; the simple fact is that Clifton don’t make block planes, let alone the blades to fit them. I probably could’ve found another UK manufacturer but, I bet it would’ve cost more than these Chinese imports (I still look upon this plane as a “prototype”-of-sorts, after all). My final shot for now shows the plane in use. You can see how my left thumb hooks around a ‘lip’ I created just behind the toe and also, how my right-hand ergonomically fits around the rear of the plane; applying pressure both forwards and downward during the cut. It was finished with three costs of Chestnut’s hard wax oil and two applications of a Superwax Polish from Smith & Roger. As I’ve somehow failed to mention this already; in case you can’t tell, this plane is made from a mixture of regular ‘light’ English oak and brown oak, where the darker streaks and staining is caused following an attack by the Beef Steak Fungus! 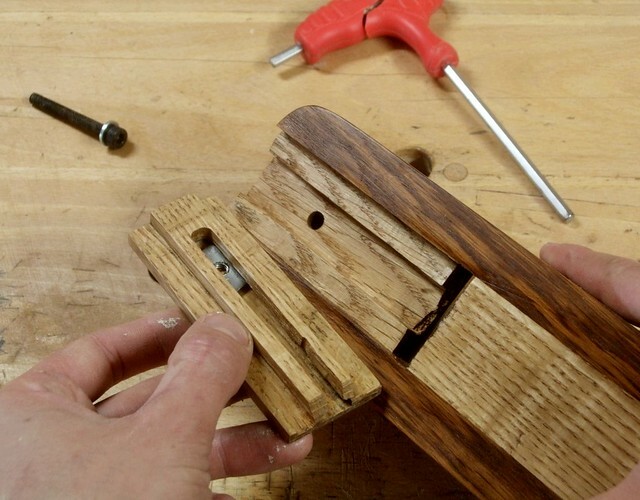 Plane “enthusiasts” may be shocked to discover that I haven’t given much consideration to all the necessary angles involved with hand-plane design… My reason for choosing screws with a hexagonal-drive head is that I find them much easier to use than the traditional slotted screw. You get a more positive location with an allen key and, if you do slip, you’re far less likely to ruin the head. Outstanding … both the build and the documentation of the build..
Nicely done. Let’s see some silky shavings from your creation. I have always wanted to build a dovetailed infill smoother but have too many pieces of furniture to build.